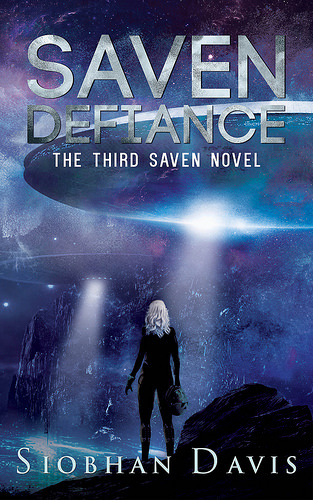 Saven Defiance is the exciting third book in the Saven series with lots of action romance and alien politics. While I found the start to be a bit slow, it really picked up about 25% in and by the end I was hooked. There is so much that happens in this book, both with the aliens and the romance and it’s makes for a great sci-fi series. And towards the end there are some plot twists I didn’t see coming and the end makes me doubt so much. There’s also some emotional scenes and heartbreak, the characters all go through a lot. I felt that Sadie really comes into her own in this book, in the novella Saven Denial she learns more about herself and she is working with that now and makes some big decisions and I really liked seeing her handle everything that came her way. The new characters we met in Saven denial also continue to play a role, although they also fade to the background a lot. And Ax really annoyed me at times with his possessive attitude. I wish we had seen more about Izzy as she doesn’t show much of her personality in this book. There are some interesting developments with Haydn and I really like his character even though he is a bit nasty to Sadie at the start of the book. This book felt quite heavy on the romance, especially in certain sections there was a heavy focus on the romance. It’s a bit too much at times, but overall I really enjoyed how the romance was handled and I like Sadie and Logan more and more. They are so good together and Logan is really mature about the whole situation and I liked how he gave Sadie her space, while also showing her how much he cared. There are some really sweet scenes with the two of them and I liked seeing them handle things a a couple as they are together for most of the book. The world building in this book mostly focuses on the alien politics, we meet a new alien race in this book and see more of the other heirs as well. There are some big things happening and we see the situation change and develop throughout the book. The whole galaxy is involved, although we only see most about earth, Saven and a bit of the Amereti and the new alien race we meet here. There are some intricacies that only now come to light. And while I still don’t like the two evil characters in this series, I do understand them a bit better now. To summarize: this was an exciting, action packed, emotional and romantic installment in this series. I really liked seeing the plot develop and there’s so much going on and so much that happens that at times it seems the characters never catch a break. It’s a bit drama heavy at times, but there’s also a great plot. There are some very romance focused scenes in this book and I really liked seeing Sadie and Logan as a couple. Sadie really comes into her own and changes as a character and I enjoyed seeing that. The world building is mostly alien politics and meeting a new alien race, but the focus is on the plot. We learn a bit more about the two evil character that makes me understand their actions a bit more, even though they still feel a bit too evil to me. The ending is not quite a cliffhanger, but it sure leaves an impression and I can’t wait for the next book! What’s the last book you read with aliens? I think you might enjoy this series. I hope you give it a try soon. That book you mentioned sounds like a good one and it can be nice to get surprised like that when you pick up a book. You know what, I don’t know what the last book I read about aliens was? Why is that? This sounds pretty cool! I haven’t read a lot of books about aliens myself, this is one of the first series with aliens that I read. And only recently I try to read more sci-fi romance. I need to bring more alien books into my reading life. This series looks really good. I’ve only read one alien book and it was Under His Skin by Stacey O’Neale. Me too! I’ve only read a few books with aliens so far, but I’ve enjoyed most of those so far. I really enjoy this series so far and it’s great to see how the author handles the alien topic. Books with aliens can be fun and I like the character development throughout this series. The author is publishing these pretty fast in a row and it’s a great series. I haven’t read a lot of books about aliens so far, but so far I like them. It’s interesting to see what type of aliens or alien worlds author came up with. The aliens int his series are mostly humanoid, they just come from different planets. I think it’s the good kind of drama, the author really knows how to write the drama interesting. I am glad to hear you will consider this series. It really is a good sci-fi romance series. I haven’t read a lot of alien books, but I am getting more into them and sci-fi romance in general this year and so far I am enjoying the genre. I am always looking forward to the next book in this series, although I think book four will be the last one. I like alien type books. Aliens are fun because they can be anything or look like anything and have weird powers. They’re fun. I agree! Here the aliens mostly look human, but they have some cool powers. That sounds pretty exciting, Lola. It’s been ages since I’ve read an alien set up. I’ll have to check this out. Glad it picked up after the first little bit! It sure is a great series, the alien aspect is interesting and fits nicely in between the other elements. I hope you’ll give this series a try. It really is a great series and it you like books with aliens, I think you’ll enjoy this series. Looks like the slow start got up to speed and kept your interest. That’s neat when a character grows and comes into their own like that. One of my favorite type of reads. The action part sounds great and oh, nice, a new alien race to meet. I like romance in stories- most definitely, but there can be too much at times when it pushes other plot elements aside. Glad this series continues to please. I will get around to it. 😉 Yes, I keep telling myself that. Aliens, hmmm, maybe it was Pale Moon Walking that was my last alien read? It was a great book! And because I was pretty sure the book would be getting better I didn’t mind the slow start too much. It was awesome to see Sadie come into her own in this book. It was nice to see some more romance in this book, but there were a few scenes were it was a bit heavy on the romance and/or drama. I am currently re-reading this one and this bothers me less now, but that might be because I already know what’s going to happen. I hope you’ll pick up this series eventually, I think you might enjoy it :). Great review. I have the first one on my kindle but haven’t gotten to it yet. It’s been way to long since I’ve read an alien book. Might just have to change that. Thanks so much for sharing!!! I hope you get around to reading the first book eventually! I really enjoyed the series so far.